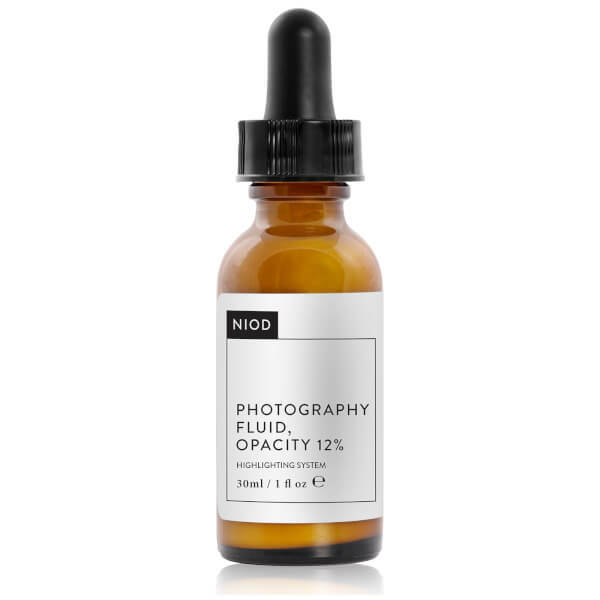 Photography Fluid, Colourless, Opacity 12% from NIOD (Non-Invasive Options in Dermal Science) combines light refraction prisms with topical photo-finishing technologies that transform skin to look instantly better in life and on camera. The serum-textured treatment has been specially formulated with an innovative Nano-Prismatic Yellow-Red Hue Corrector to minimise the appearance of imperfections and leaves skin with an even tone. Patented Dragon Fruit Chromatic Refractor is a bio-fruit complex tested under multiple light conditions and camera settings to boost the skin's radiance, whilst a super-blurring suspension improves the surface and visibly reduces fine lines and pores. With an Oil-Free Hydration Bio-Sugar Complex, the fast-absorbing treatment delivers intense hydration that lasts 48 hours after application, allowing the product to work on even the driest of skin types. Achieve healthy-looking, picture-perfect skin. E.N.